Deluxe Moose Hollow vacation condo in Eden Utah. 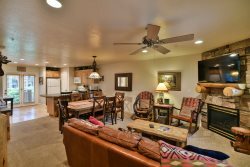 This Deluxe three bedroom Moose Hollow condo #1106 has a large kitchen/living area and sleeps 8 people. The condo has had a complete updated makeover, including all brand new living room furniture with 2 super comfy recliners, a full size microfiber sofa, plus all new bedding & decor throughout! Walk inside the door you will find spacious living space, with a rock fire place, Satellite TV, DVD player, and French doors to a deck overlooking the common area. The living area opens into a large kitchen / dining area, with French doors and another deck overlooking Nordic Valley. The kitchen is fully stocked for all your cooking needs. A half bathroom separates the main floor Master Suite that has a queen bed and a large bathroom with a jetted tub. Upstairs there are two bedrooms. Bedroom one has two queen beds and is beautifully decorated. It has a has a new 32" TV/Dvd Combo. Bedroom two is another master suite with a large King bed, Satellite TV, DVD player, a rock fireplace and a full bathroom. Located just off of Wolf Creek Resorts 18 hole golf course. This condo is just minutes from Pineview reservoir, where you can launch your boat and enjoy the wonderful lake and all the beautiful views. Mountains surround you in your every adventure, mountain biking and hiking trails for every sightseer. After you days in the sun enjoy a relaxing soak in the outdoor seasonal swimming pool and hot tub, or take in Ogden Valley’s wonderful specialty restaurants with a twenty minutes drive for night time fun. This Great condo offers a spacious floor plan, free Wi-Fi,large screen TV, private balcony with a great view of the Wasatch Mountains and Wolf Creek Utah ski resort. Features; Boot and Glove Dryer, Fireplace, TV, DVD, Stereo, CD Player, Fully equipped Kitchen, Coffee Maker, Microwave, Dishwasher, Refrigerator, Cooking Utensils provided, Linens provided, Washer, Dryer, Hot Tub, Sauna, Pool, and a private ski locker. No Smoking, No Pets. Greg was super nice, informative and easy to work with. I would definitely book through him again. We had a great time and will be back! I contacted Greg a few different times prior to the weekend we stayed. He was always very quick to answer my questions. He is great to work with. We love this condo and choose it every year. It's like coming home! Thanks to Valin, who got us connected! Our family had such an amazing experience! Love the location! It's right in the middle of such a beautiful area with lots of things to do without the crowds and hype! We loved our time there and plan to come back at different times of the year! All reservations are billed a 3% one-time credit card processing fee. Departure cleaning is $110.00 included in total price. 50% of the total is due at time of booking. The full amount is due 30 days prior to arrival. Cancellation Policy: Any reservation canceled 30 days or more prior to arrival will have their deposits refunded minus the $30 processing fee. Reservations canceled between 15 to 30 days of arrival will forfeit 50% of the rental rate. Reservations canceled within 14 days of arrival will forfeit the entire amount of the reservation.